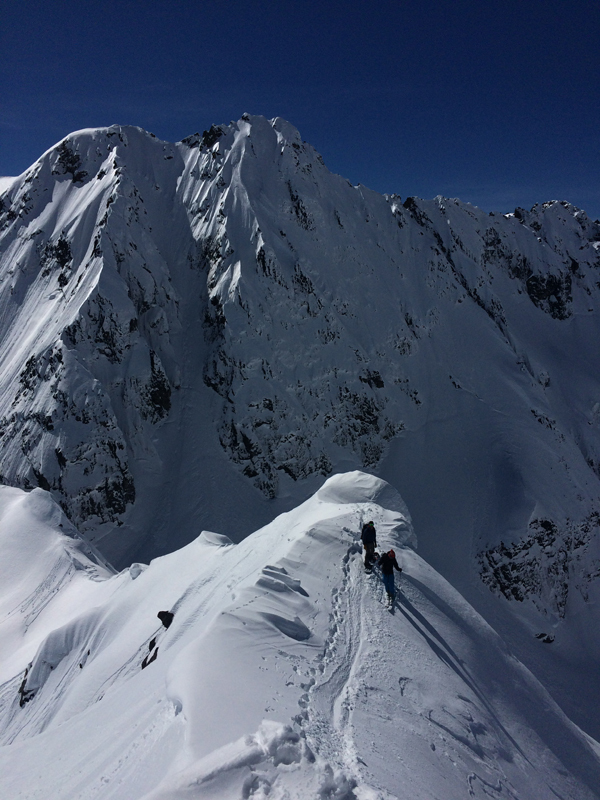 On March 30th, Nels Reese, Tom Murphy and myself skied the north face of Pelton Peak, having climbed up the NW gully from the Yawning glacier. 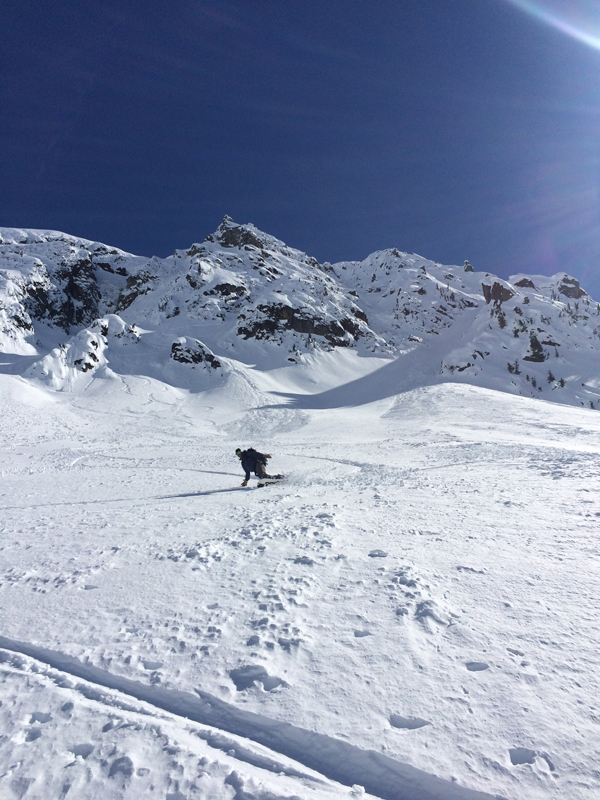 A motivating trip 4 days prior to ski on Magic Mt with Eric �the Beast� Noll and a good weather window before the road closed set us up for adventure time on Pelton. Photo from Feb 2015 with the route. Much more snow now. 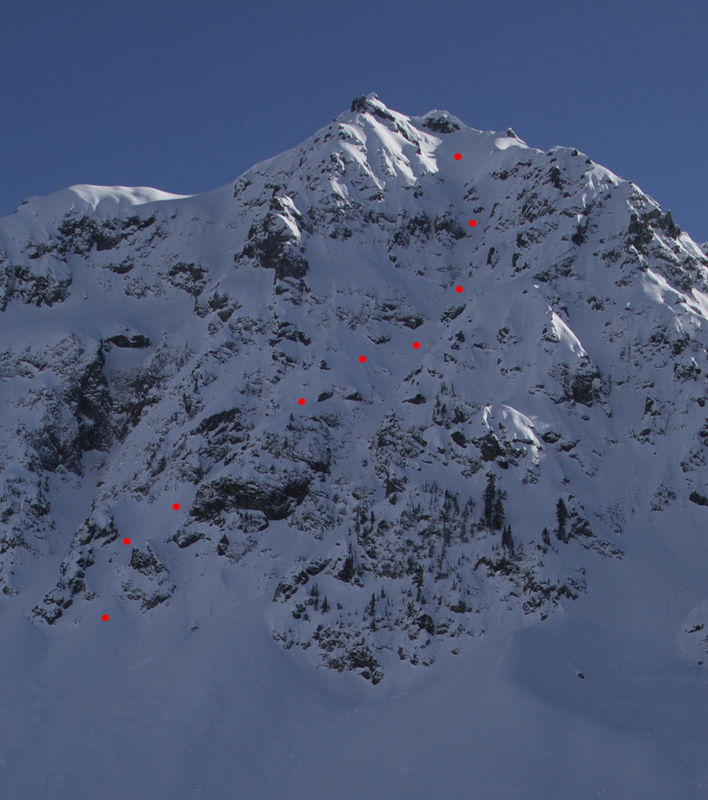 The descent follows the main gut falling straight from the summit, and exits skiers right above the bottom cliffs. We dropped in blind, but had a good look at the line from skinning up below it and had some pictures with us taken on the previous Magic trip. The main crux is the left-turn dog leg at the bottom of the top pitch, which could easily not go with any less snow cover. After a few trips to the Pelton basin, this was my first time climbing Pelton proper. It probably suffers from height-induced neglect given its taller neighbors but... the views it offers are not too shabby. We�d soon find out that the skiing would equal the views. On the summit ridge, Magic mountain behind. Below the crux (no pics from crux, hands too sweaty) we had some great turns a la scott schmidt, before traversing the hanging snowfield into more great skiing in the exit couloir. 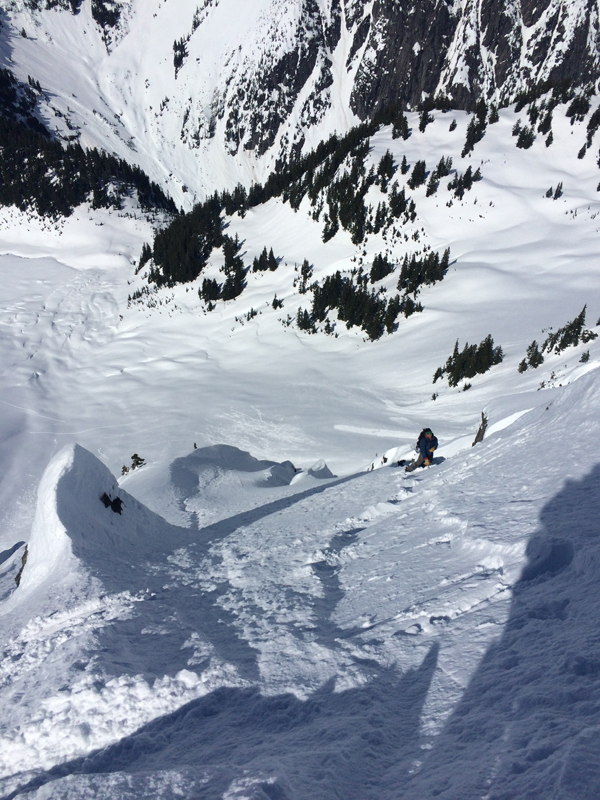 At the end of the traverse into the exit couloir. Full shot of the face. Several more possibilities on this face�. All in all, good snow, great line, superb times. We enjoyed an evening of smoked oysters, fine scotch, William Onyeabor and other treats camped under Pelton & Magic while they bathed in full alpenglow before a warm night and hawt following day scuppered further plans. Things will sadly be a lot different when access becomes possible again but the skiing in this valley is tremendous. Go get sum. crux was narrow, icy, steep? Definitely spicy! Please note: this post belongs under March trip reports. Therefore any claims at first descents are disqualified.